In the face of yet more scientific evidence of the adverse health effects of genetically modified foods, country after country is working to ban, limit or restrict the cultivation and testing of GM crops. But as the biotech giants gear up the PR war against their opponents, the question of what people can do to avoid GMO foods is becoming more important than ever. Genetically modified food crops have long been sold to the public as the answer to humanity’s 21st century food supply problems. For decades now, the public has been told that they are safe for human consumption, that they will improve crop yields, that they will require less pesticides and that they will be the safest, most effective way to feed the world’s population as we head into times of severe instability in the global food supply. Although scientific research have long exposed these claims as biotech propaganda, a new batch of studies in recent months have garnered attention for upending every one of these claims about GMO technology. Last month, a new study published in the Journal of Food and Chemical Toxicology found that rats fed Monsanto’s patented NK603 gmo corn were more likely to develop tumours and suffer severe liver and kidney damage. The study followed 200 rats over two years, divided into 10 groups of 10 males and 10 females. Three groups were fed the NK603 corn alone, three groups were fed the corn treated with Roundup herbicide, three groups were not fed the corn but their water was treated with Roundup, and a control group was fed non-GM corn and plain drinking water. The researchers found that the rats that consumed the GM corn or the Roundup, separately or combined, were prone to serious health problems that typically did not manifest until the fourth month of the trial. Industry-sponsored rat feeding tests only span three months. This is in addition to numerous studies in recent years showing that, contrary to the claims of the GM food supporters, GM crops neither produce larger yields nor reduce the amount of pesticides necessary for the cultivation of crops. A 2009 study by the Union of Concerned Scientists foundthat genetically engineered crops produced no significant yield increases, and what increases in yield were detected were almost exclusively due to traditional breeding and improvement in agricultural practices. This was affirmed in a report to the UN Human Rights Council last year showing that the scientific literature demonstrates that the greatest potential for increased yield in the future comes not from gmo foods, but from organic agro-ecological practices that are capable of doubling yields within entire regions in under 10 years. A 2011 study coordinated by the International Commission on the Future of Food and Agriculture showed that GMO crops were promoting the creation of “superweeds,” contributing to food insecurity, and required vastly higher concentrations of pesticides to be sprayed. As convincing as the results of this latest research is, it only adds to an already voluminous body of research in the scientific literature that has already undermined claims of GMO’s safety and efficacy. Earlier this week I had the chance to talk to independent journalist and researcherAnthony Gucciardi of NaturalSociety.com about these studies, and the detrimental health effects that have been tied to the consumption of genetically modified crops. The reason that this scientific refutation of the safety and efficacy of GMO technology has not reached the general public is hardly mysterious. 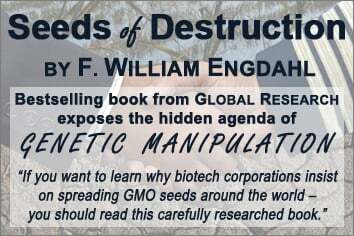 The biotech giants whose very reason for existence is the promotion of the GMO myth have fought a long and protracted campaign to smear, undermine and cover up studies pointing out the disastrous consequences of the use of this technology. This process has been underway for years and, unsurprisingly, the GMO PR machine is once again revving into action to attempt to counteract the damage to the reputation of genetic engineering technology that this recent research has caused. Immediately upon the release of the latest rat feeding study, a coordinated effort to undermine the study and its researchers began. Critics pointed to perceived flaws in the collection, reporting and analysis of the study’s findings. One of the key voices driving the campaign against the study was the Science Media Centre, a supposedly neutral party that connects journalists to scientists when important scientific discoveries are in the headlines. The Science Media Centre itself, however, is funded by bodies like CropLife International, a biotech trade association working to promote the interests of biotech companies around the world, and Syngenta, one of the key biotech seed giants. It has also received funding directly from Monsanto UK. In the wake of the publication of the new study, the popular GMO information website GMWatch.org was targeted with an aggressive cyber attackthat succeeded in almost crippling the website. The site operators had to direct traffic from their main page to their Twitter account at the height of the attack, which they noted was not the first time that outside forces had attempted to take them offline. GMWatch is not funded by the biotech industry and regularly publishes news, information and studies demonstrating the health risks of GM foods. In the United States, meanwhile, the fight for a proper, standardized labelling system for foods containing GMO ingredients is heating up. In California, citizens are preparing to vote on a ballot measure, known as Prop 37, which will require clear labelling for genetically modified products. As promising and hopeful as it is that people are moving to ban GMO foods from their country, and as helpful as movements like the Prop 37 GMO labelling movement are in raising awareness of the issues, such activism runs the risk that the public will be placated into thinking that the legislative process can be relied on to keep this genome-altering technology in check. This thinking is ultimately utopian, seemingly ignoring the existence of the long-acknowledged revolving door between the biotech corporations and the institutions like the FDA which are supposedly there to monitor and regulate them. In the case of Prop 37, draft proposals of the text show lengthy lists of exemptions that would allow animals that have been reared on GMO feed, or foods that contain as many as 10 GMO ingredients, being labelled as “non-GMO” foods. It is scarcely believable that any attempt to check the spread and use of these GMO foods by purely legislative means will survive the legislative process in a state that would render it ultimately effective. Much more important, as always, is what individuals can do for themselves to insure that they do not purchase, support or consume GMO products. Although the process of sorting through the ingredients and production processes of various foods can be a bewildering experience, grassroots movements are now taking advantage of the crowdsourcing and networking powers of the internet to do an end-run around the government regulatory process altogether to create usable, practical lists of truly non-GMO foods that can be cross-referenced by anyone with access to the internet. Websites like that of the Non-GMO Project at NonGMOProject.org are helping concerned citizens to take matters into their own hands to empower them to avoid GMO products altogether and to stop supporting the corporations that are producing these foods with our own funds.